One of the country’s fastest-growing cities suddenly has a long-term water problem. The weather was uncharacteristically drizzly for late summer when Seattle Public Utilities tour guide Ralph Naess, tooling along a backroad in the city-protected Cedar River watershed, suddenly looked skyward with alarm at a sudden sunbreak. It’s not unusual for the folks at SPU who are responsible for making sure Seattleites have drinking water to get nervous at this time of year. Even in a typical year, officials carefully watch the weather and the calendar as the water level of the Chester Morse Reservoir recedes. It’s their annual waiting game: When will the fall rains return? However, new science is bringing a waiting game of another sort. For years, SPU assured the public that Seattle’s prized — visionary, even — water-supply system was resilient enough to weather the warming and drying effects of climate change. Nothing to worry about for at least 45 years, they said. But with this summer’s potent drought already killing fish and firefighters, the longterm outlook for Seattle’s water supply is suddenly quite different. Quietly unveiled to regional water managers over the summer, the admittedly incomplete — and yet extremely sobering — calculations show the amount of water Seattleites can count on could be reduced by as much as half over the next 35 years and nearly three-quarters by the end of the century. That’s assuming a lot of things, including not killing off salmon runs and rarely asking anyone to cut back on water use. But still, the magnitude of the potential water loss quickly caught utility managers’ attention. In short, climate is suddenly much more of a threat to Seattle’s water supply. It wasn’t that long ago that SPU officials thought they’d gotten out ahead of the climate threat, utilizing a system of two mountain reservoirs, the Chester Morse fed by the Cedar River just south of Interstate 90 and the Tolt River south fork reservoir upriver from Carnation. Showing remarkable foresight, Seattle voters in 1889 approved a plan to launch a city-run water system to bring water to the city from the Cedar River watershed. The water system started operating in 1901. Today the city owns the watershed. But now we’re learning the limits of this investment as climate change worsens. SPU has run eight of a planned 40 regional climate change simulations created by downscaling global computer models that plot the likely trajectory of climate change. The results are ugly and, as it happens, this summer may have provided a bit of a preview of what’s to come. This year Seattle and the Northwest saw snowpack plunge, in many areas to less than 10 percent of normal. That was followed by a spring with relatively little rain and an extremely hot early summer. That prompted SPU and neighboring utilities to request a voluntary 10 percent cutback on water use Aug. 10 to avert potential water shortages in the fall. Scientists have long predicted that climate change will cause the Northwest to receive more rain and less snow. Hotter, drier weather causes more evaporation — and increases water demand. The scenario that played out this year included all of that. Almost all the future scenarios modeled by SPU showed big drops in what’s known in water-utility lingo as “firm yield”: the amount of water that can be reliably delivered. Even assuming a drastic cutback in the amount of greenhouse gasses being emitted today, Seattle is looking at reduced firm yield of an average of about 30 percent through 2050, according to three of these future climate simulations. How seriously should we take these simulations of future climate? “The climate models are not perfect,” acknowledges SPU climate researcher Paul Fleming. But these simulations are clearly showing that “climate change will increase the magnitude and the likelihood of those events occurring,” Fleming said. SPU planners will be taking a closer look at why the simulations are coming out this way. Are the scenarios they project realistic? For example, is that eye-popping 51 percent based on the equivalent of transporting Palm Springs’ weather to the Northwest — an unlikely event even with global warming? Before this summer, SPU officials were confident based on the 2007 output of three computer models that led them to conclude there would be no huge water-supply problems before 2060. Now they are looking at many more models, and the accuracy of many models has improved since 2007. The simulations incorporate increases in population of about 35 percent between 2010 and 2050. Right now Seattle’s firm yield is 172 million gallons a day as an annual average, and average annual demand is about 125 million gallons a day. Those annual average numbers can be misleading, though. Demand is usually about 100 million gallons a day in the winter and 200 million gallons a day in the summer. Many of the regional simulations done so far were based on some of the global models that seemed likeliest to stress Seattle’s water system. In other words, it’s possible that these model runs represent a worst-case scenario. But, by definition, we won’t know that until all the models are run. That takes time. SPU estimates that work will be done sometime next year. Then the fun begins. Utilities officials will have to make some educated guesses about what all these numbers really mean. Which models should they believe? Maybe they should blend the results of those most close to each other, figuring they’re most likely to be right? Sounds reasonable. But on the other hand, climate change has progressed far faster than virtually any scientist predicted even 15 years ago. What if the 51 percent reduction in firm yield really is in store? What then? Oh, and remember that’s just from now until 2050. A second set of calculations using the same computer models examined 2050-2100. Yowser. The average of five business-as-usual scenarios was a 51 percent reduction — the very same number that was an outlier in the 2015-2050 runs. Water flows out the back side of the Masonry Dam, part of a system that has been used to deliver Cedar River water to Seattle since 1901. Utilities officials hope to tweak the system to prevent future water shortages. At some point in the next year or two, SPU officials are likely to be sitting before the City Council explaining what the numbers show, what their best guess is as to what we face with climate change, and some suggestions for how to proceed. Already the utility is thinking about potential adaptations that could lessen the severity of future droughts. Water managers are kicking around a variety of options, although they have not done a formal alternatives analysis. 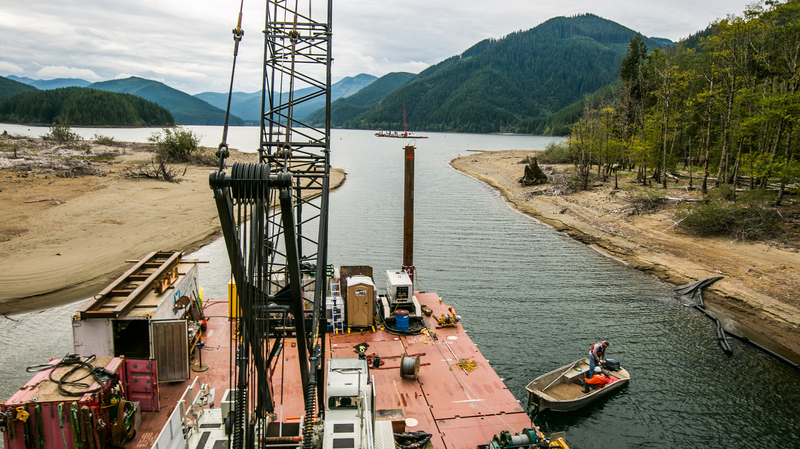 One idea is taking advantage of Lake Youngs, downstream of the Morse Reservoir, where a treatment plant purifies the water on its way to Seattle. Right now SPU keeps Lake Youngs full at 11 billion gallons basically all year. Some of that water could be used to bridge a future gap. Trouble is, if the level of Lake Youngs drops too much, leaving big exposed banks of mud, windstorms could wash mud into the water supply. The city might well have to build a new water-treatment plant to filter out the crud. The last cost estimate: $200 million to $250 million. Interconnecting the Seattle, Everett and Tacoma water systems could also provide extra flexibility — but the political challenges of doing that could prove difficult, not to mention expenses that would easily reach into the hundreds of millions of dollars. Also, the city has a 1936 claim on water from the north fork of the Tolt River that it could try to call in. But what’s been the most cost-effective method to balance the water budget historically has been water conservation, starting when water managers in the late 1980s could foresee a day when demand exceeded supply. Seattleites’ now-legendary water conservation efforts were strengthened by a severe 1991 water shortage which led to water use restrictions, including the city’s first ban on lawn watering. The water cutbacks served as a wakeup call for the populace. 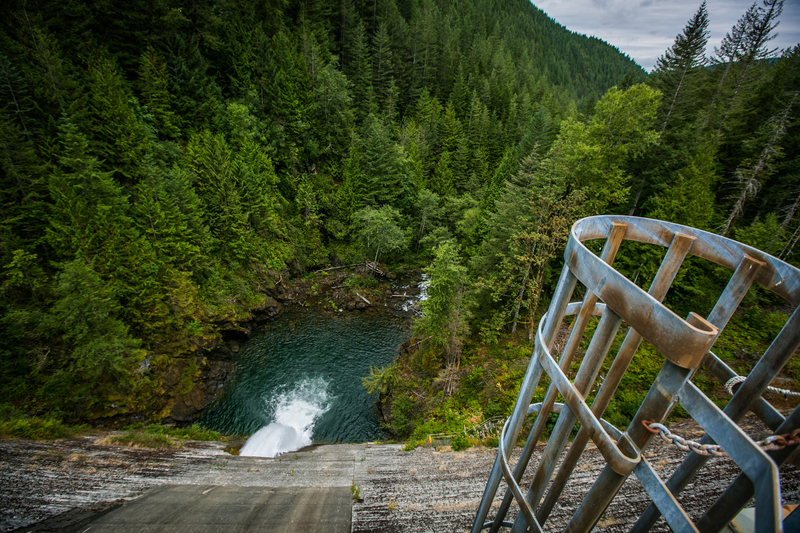 SPU programs like giveaways of low-flow showerheads and a block rate pricing structure that encouraged conservation all helped reduce the region’s thirst. But one of the biggest long-term changes in water use came from the state outlawing the sale of inefficient toilets and faucets in the early 1990’s. Seattle today is using about the same amount of water it was in the late 1950s — with double the population. Equipment is deployed to install pumps in the middle of the Chester Morse Reservoir. The system will be used to move extra water out of the reservoir in dry years. The new climate science highlights a problem with the whole region’s water-supply system in the face of climate change: a lack of any place to store water for more than a year. Even California’s four-year-long drought was ameliorated somewhat by that state’s ability to carry over water supplies from year to year. But in Seattle and most other places in the Northwest, we count on snow falling on the mountains to slowly melt through the spring and summer as we empty reservoirs that are to be replenished by the next winter’s rain and snow. It didn’t happen that way this year, with virtually no snowpack in the mountains come spring. Yes, we do pay a price for those gorgeous February afternoons we enjoyed not that many months ago. The water “bank” was bare as what turned out to be a record-breaking summer baked us. SPU officials changed their normal operations. Usually they wait until fairly late in the spring to start refilling the reservoir. Translation: they let water go downstream so they have room in the reservoir to store floodwaters, and understanding that if no storm comes through, there still will be plenty of snow in the mountains to recharge the reservoir. This year, though, with snowpack virtually absent, they held water back and started refilling the reservoir early, in effect gambling they would not get hit with late back-to-back Pineapple Expresses, which can fill the Morse Reservoir in just three to four days. That strategy paid off this year (and wasn’t a huge gamble this time around, anyway, because of the near-absence of snowpack). It’s the kind of adjustment that SPU officials hope to be able to make in the face of climate change. But what about a year if they miscalculate one year and, say, get back-to-back Pineapple Expresses in May when they do have some snowpack on their hands? They could have too much water and risk flooding. That’s just one illustration of the kinds of trade-offs and calculated gambles climate change might force water managers into. Water conservation could go a long way in helping the future water crunch. The numbers in the models refer to firm yield, which by definition means that the water system can meet all customers’ demands 98 percent of the time. So if we count on more frequent water cutbacks—say, once a decade, or 10 percent of the time—then by definition the numbers produced by the models won’t be so eye-popping. Still bad, but not as bad. And we’d have to make do with less water more often. That’s the bottom line. SPU gets credit for even undertaking the planning exercise. The utility has organized an internal Climate Resiliency Group and is a longtime member of the Water Utilities Climate Alliance, a group of 10 large water utilities around the country paying special attention to climate change planning. Similar water-supply-planning exercises are going on in Tampa, New York City and Portland. Most utilities aren’t doing this. Alex Chen is doing a lot of thinking about this nowadays. 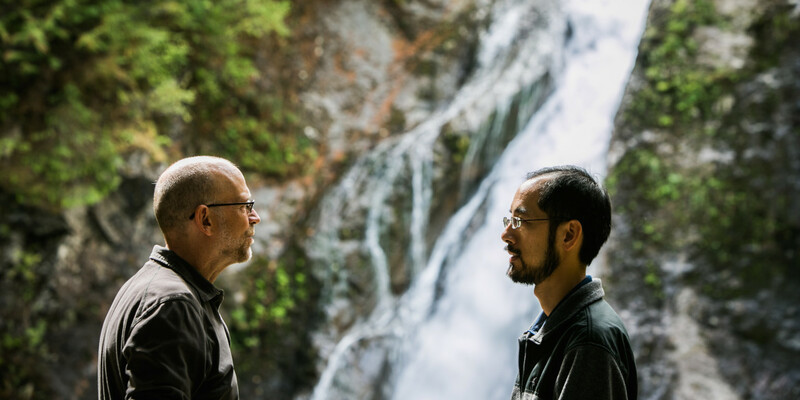 SPU’s director of water planning, Chen is a thin man with a carefully trimmed beard who remembers all kinds of arcane numbers — and can quickly pull one up on his smart phone if he forgets it. “How are the demand and supply lines going to cross, and when?” he asked as Naess drove visitors around the watershed recently. Chen is exploring various ideas for maximizing the water system’s performance. Maybe more water can be stored in the Cedar and Tolt reservoirs. Maybe more water that falls on Seattle itself can be reused somehow, although it’s unclear how practical or affordable that might prove. And there are really expensive solutions such as desalinization. SPU says it will first try to maximize the performance of the current system, but can see a day when perhaps bigger investments will be needed to either increase supply or tamp down demand. For all the thinking Chen does about the future, he’s also pretty focused on what’s happening this year. “I wonder if our sun is gone for the day?” he asked Naess when clouds returned. Robert McClure visited the Chester Morse Reservoir with photographer Paul Joseph Brown. The Cedar River watershed is in near perfect structural condition because it is entirely owned by the City of Seattle, and SPU long ago stopped logging it and began to practice restoration forestry in order to restore it. The Tolt watershed is still in checkerboard ownership, and parts of it have been heavily logged in recent decades. At times the Tolt spigot has to be turned off due to water turbidity, possibly stemming from greater areas of logged over land. Of course this typically occurs in the winter during heavy storms when there are no water supply shortages. I wonder though if acquiring the portions of the Tolt watershed that Seattle doesn’t already own in order to fully restore mature forest cover would increase and/or make the Tolt’s water supply even more dependable over time as the forest recovers from logging. I have noticed a lot of lawns this year that seem browner than usual, so it seems that a lot of people are responding to SPU’s so far rather quiet and modest requests that rate-payers conserve water. I wonder if people would conserve more aggressively if they were given a discount on their bills in exchange for proof that they have water-saving devices in their home and/or xeriscaping on their property. Thanks for your interest. I knew there were some ownership gaps in the Tolt watershed and should have figured it’s a checkerboard situation. I had not hear about the siltation in winter storms. Good to know. Humans’ use of fossil fuels, and the resulting carbon dioxide air emissions, has no material effect on climate. Human activities cause only about 3% of all carbon dioxide (CO2) emissions to the atmosphere. Most of the rest are the result of decomposing plant material. CO2 is in equilibrium. It is a weak greenhouse gas in theory, but its actual climate effects are nullified by stronger forces, particularly the formation of mineral carbonates from atmospheric carbon dioxide. The theory of fossil fuels-caused climate change is a false premise for any regulation. Anyone who passed 10th grade chemistry can conclude this using public information sources. Limestone and marble are the most familiar forms of mineral carbonate. CO2 is an essential component of mineral carbonate (CaCO3, for calcium). Carbonates are the ultimate repository of atmospheric CO2. Carbonates form in seawater and soils through biological and chemical processes. The formula is CO2 + CaO => CaCO3. Virtually all carbonates are formed from atmospheric CO2 that is taken up by seawater or soils. You can make magnesium carbonate in your kitchen by mixing carbonated water with milk of magnesia. The detailed perspective is presented in the paper http://www.co2web.info/ESEF3VO2.pdf by Danish researcher Tom Segalstadt. The paper is not “peer-reviewed”, but seems rigorous. (It has recently been shown that “peer review” really means “crony review”.) Activists use ad hominem arguments to dismiss the paper, as they do any argument they dislike. Fossil fuels (especially coal) producers and users are being persecuted in unprecedented fashion—a literal pogrom. A 21st century Scarlet Letter. It is now known that Soros-related investors and other progressive interests are buying up coal assets at deep discounts from their recent values. It seems like a Joe Kennedy “bear raid”. We should take a holistic view of this regulatory and political process. Where is it taking us? Who wins? Who pays? How is the public served? I read this stuff and am a little alarmed by the optimism. Geologically Western Washington has been a desert during the, between ice age warm-ups. And, actually by the text book definition since the water table falls over 6 inches during normal “summer” periods we are technically a desert geologically right now, that is why we have so many “dry loving” native plants, most closely kin to real desert plants, madrone, oregon grape and salal to name a few. I think it is reasonable that we could become a dry desert again, and that the tipping point is apt to take us by suprise if we are not very careful.